As in the original, players breed horses, cows, sheep and pigs to attain victory points, organising and expanding their pastures along the way. Trying to maintain enough space for 4 different livestock. During Refill, you look for the places on the board that have a little arrow on them, and you add the relevant goods to that space. You have to get more than 3 of each animal to avoid a -3 penalty. The setup is the same each game and the first few turns will generally fall into a familiar opening pattern. My biggest complaint is, again, that scoring track on the side of the box. The animals come in four varieties: sheep, pigs, cows, and horses. The components look a lot like those from Agricola: the illustrations and icons are fairly well-designed so that even before you read the rules you can recognize that the little yellow bars match the yellow wooden borders, and so on. You have to feed your family in increasingly shorter interval while never quite being able to do everything that you want. Ranked multiplayer is the heart of All Creatures. I play Agricola mainly 2p anyway. Liu is a series focusing on two-player board games. But each space can only hold one worker, so once that spot has been taken, nobody else can take that same action until the following round. It's a surprising amount of strategy for 30 minutes. This adds a couple dozen unique building tiles that you can add to the base game along with a new farm expansion tile. You can experience the additional buildings without purchasing the expansion: ranked multiplayer games are always played with a rotating selection of structures from the expansion, whether you want them or not. It may well be that, with both games being as strong as they are, the player base will converge on the better-supported of the two titles. Have you found this to be a game with a lot of legs or does it feel repetitive or the novelty wear off what 2p game did you turn to if this happened? Experience another faithful boardgame conversion from the studio behind Le Havre: The Inland Port and Patchwork. Each round, there are four phases: Refill, Work, Home, Breeding. The initial simplicity of All Creatures is deceptive. I've only put in a couple of plays with this expansion but it definitely adds replayability to a great two-person game. A completed farm with horses crammed in the corner. This is not a hard and fast rule but its generally good to specialize, especially early on in the game. Just getting it out and setting it up for the photo above, and then putting it all away, took nearly as long as it would to play an entire game of Agricola: All Creatures. The farms may also be expanded by acquiring additional land on either side and players are rewarded for developing the newly expanded areas. 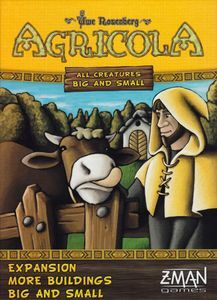 Keep in mind that although All Creatures does a great job of creating an excellent 2 player game without some of the baggage of Agricola it does not claim to be as deep of an experience. Finally, you get bonus points for the animals by referring to that chart on the side of the box: you lose points if you have three or fewer of any type of animal, and you get bonus points for having a bunch of the same type. 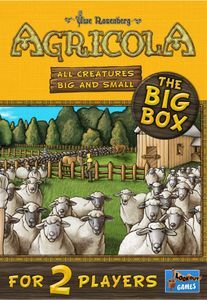 New strategies abound in this expansion to Uwe Rosenberg's two-player hit, All Creatures Big and Small! These buildings add variety to a base game where only 4 unique building tiles exist and add extra strategy options to an already excellent 2 player only game. At the same time, it's still a very satisfying game with building a little farm and breeding animals. One space also lets you take the starting player tile for the next round. 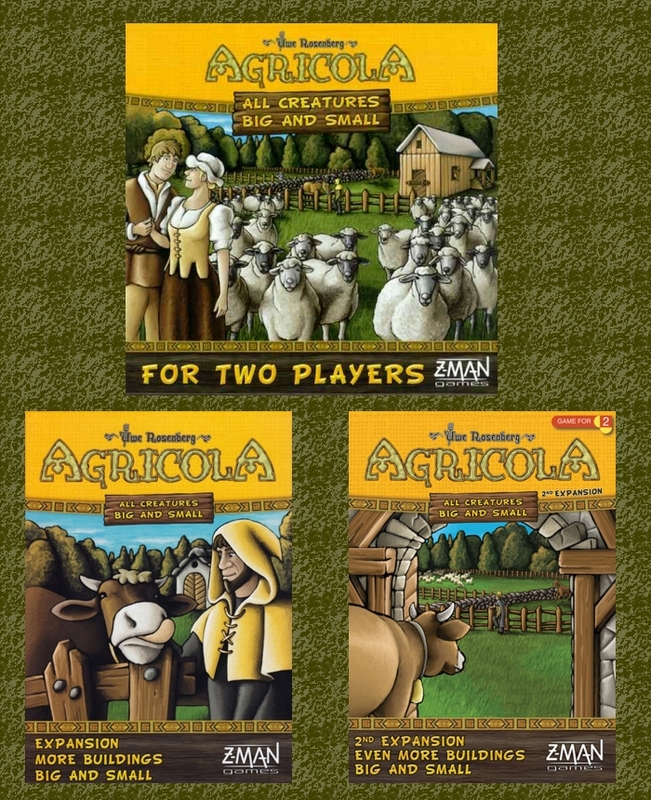 Gone with the wheat is Agricola's seasons mechanic, the all-important harvest turns one prepared carefully for. I got this as a gift for my fiance and we've probably sat down and played a few rounds at least once a week since, and even got both expansions. Pick a player to be starting player and give them the starting player tile. The main board, where workers are sent to do your bidding. The mechanics can be a little abstracted, but the idea is that you each have a few workers that you can send out to do particular tasks: gather resources like wood or stone, build fences and buildings, or gather animals. I play a bit of a variant where I put out twice as many of the unique buildings there's a set of 4 in every game , so there are 8 unique buildings each game and the first thing you do is study them and try to figure out which will work well together in a strategy and which to try to race the opponent too. Wheat, barley, corn, oats and sorghum: not a chance. Mixing these new tiles in with the base game and the first expansion every time we've played lately made for even more thinking and planning i. I've caught myself wondering how best to use these new tiles when I should have been paying attention at work, or catching up on my sleep late at night. The more you have of a particular type of animal, the more bonus points you may score. Product Description This second expansion adds another 27 new special buildings! Placing a worker will immediately carry out the action that the worker was placed on and block that action for the remainder of the round. Top that with the fact that it sets up and plays in a much shorter timeframe and we suddenly have Agricola-lite that we can pull out on a weeknight or take with us to a coffee shop. In case anyone was wondering, you do not need the first expansion to use this expansion. 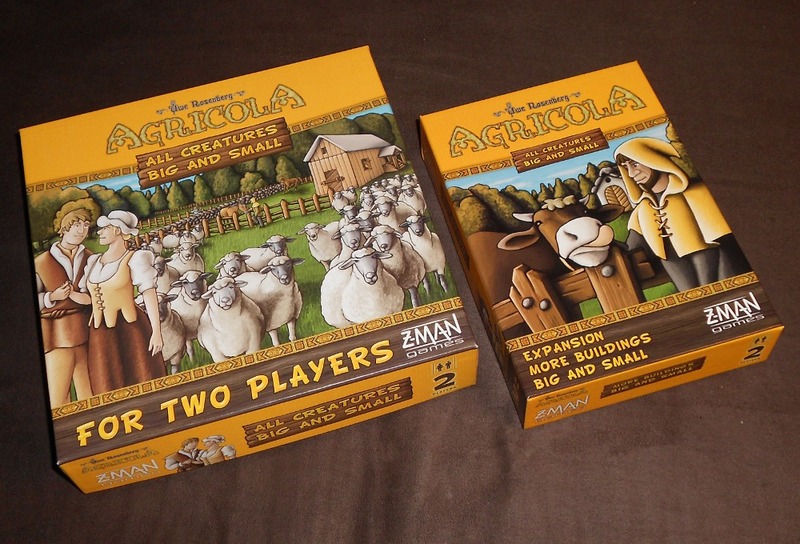 Has Agricola produced sheepish offspring? I definitely prefer the game with the expansion included for the extra depth and variability. A price is yet to be announced. Animals can be moved around on your farm as needed, but anything that has been built has to stay put. Just different strokes for different folks. As it is players will quickly exhaust the singleplayer experience without it, and then may prematurelhy write off the game as played-out, or be else put off by the unfamiliar buildings in multiplayer. The tension comes in adapting to what the other player is doing, both in adjusting your plan when what you wanted gets blocked and preventing the other player from taking a spot that they were hoping you would ignore. Some might give pasture space and a way to get an extra early horse to start breeding earlier than normally possible. 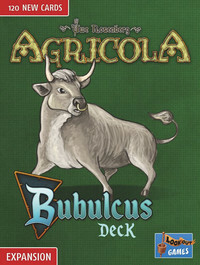 On tabletop, Agricola is intimidating. 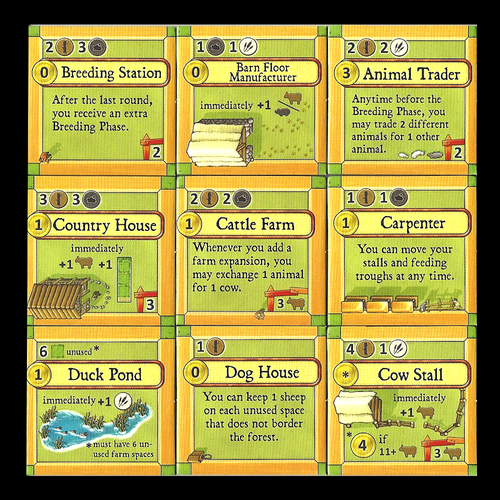 At the start of the game the farm boards consist of a single cottage, a building that can hold one animal, and a limited space to grow. This is not a solitaire experience with both players building their farms exactly how the want. Quit cannodling and get to the Breeding Station! The one note of criticism that I would bring up is the lack of variability between plays once players become experienced with the game. Breeding animals only produces one offspring no matter how many of that type you have. About This Game Includes the first expansion More Buildings Big and Small! Also gone is the family growth mechanic. I hope the Farmers of the Moor gets a 2016 compatible revision soon, too! It is also short enough 40 min that you can play multiple matches in a row without wasting a whole day. It does have a little bit more variability than Caverna from game to game with the expansions, as several buildings are randomly selected for each game. Many of the new buildings can be gamechangers, opening up new assymetrical strategies, as any given building can only be built once per game. Quite a few break in game rules, or create more of an engine, or give you a sort of player power, really all kinds of stuff. Liu The one really odd decision is that the scoring for the game is split in two places. Work is when you take turns sending your workers out to do things. Home is when you collect all your workers off the game board and put them back near your farm.